This luscious, creamy, warm beverage is caffeine free, nutrient dense and inspired by the bulletproof concept. The ingredients support healthy immune function, restore muscles, increase metabolism and fuel the body with healthy fats. It contains almost no carbs, is high in fat and rich in protein, making it suitable for ketogenic and paleo eaters, vegetarians and anyone looking to add some seriously delicious nutrition to their day. It’s perfect for morning, daytime, after a workout or, my favorite, in the evening. Gently melt the cacao butter on a double boiler over the stove (I use a metal bowl over a small pot of boiling water). Use filtered water in the bottom pot as this is the water that you will be using. 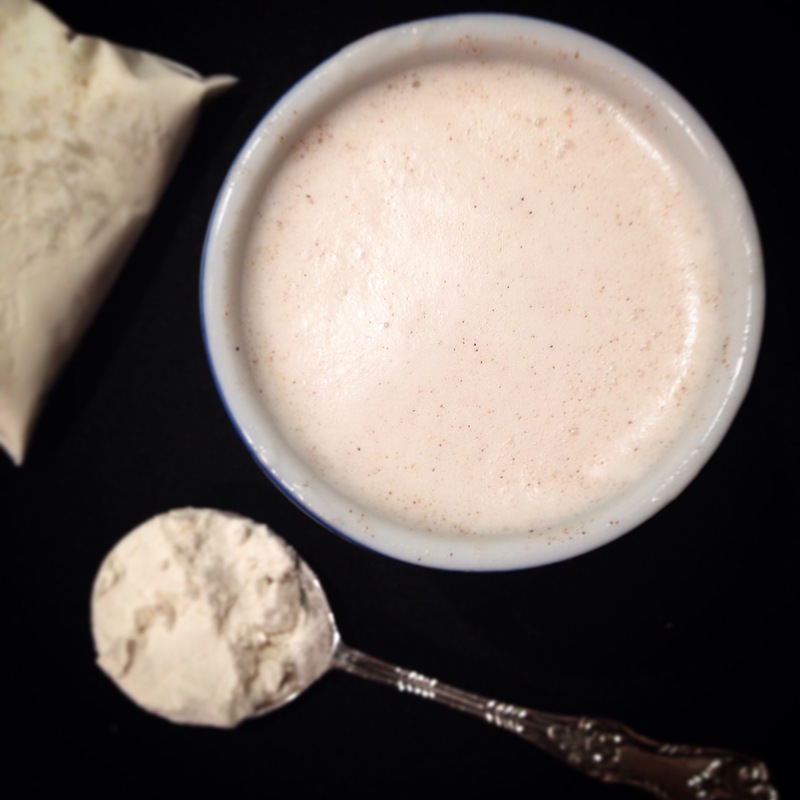 Put the grass-fed butter, MCT oil and chai spice into your heat-safe blender. Once the cacao butter is melted, pour it into the blender along with the boiled water. Blend on high to emulsify. Reduce speed to low and pour in the coconut milk – this will cool off the liquid a bit before adding in the valuable RAW colostrum. Add the protein, colostrum, ashwagandha and vanilla drops. Give it another blast on high until it’s fully blended. Pour into your favorite mug, smile and enjoy. Mix together and keep handy for shakes, smoothies and elixirs, yogurt topping, granola and nut spicing, in teas, coffees and hot cacao. Colostrum is the milk first produced after a calf is born. It is extremely rich in immune modulators, hormone regulators, growth factors, prebiotics, probiotics, amino acids and enzymes. It is the first milk that a baby receives and is meant to construct a healthy immune system rapidly in newborns. Colostrum is thought to be one of the worlds most superior foods with amazing potential to promote longevity and regeneration. I get my raw, organic colostrum from the Light Cellar. Cacao Butter is the raw oil from cacao beans (cocoa butter is not raw and has been heated at very high temperatures). Cacao butter contains a range of healthy fats that have been shown to improve memory, mood and cardiovascular health. It’s also what provides this drink with it’s silky, luxurious texture and light chocolaty flavor. Ashwagandha is one of my most favorite herbs. It is a tonic herb and can safely and beneficially be consumed daily. It’s an Ayurvedic herb that translates to “the smell of a horse” as it’s thought to provide robust, vigorous energy, like that of a horse. It is most commonly used for stress, low energy levels, fatigue and difficulty focusing. It has a light flavor that is undetectable in this drink and is a great way of tonifying the system after a workout or a long day. Chai Spices are stimulating and vitalizing while calming and mentally clarifying too. These herbs are warming, promote circulation and may balance blood sugar and increase metabolism as well.